Arsenal manager Arsene Wenger believes the club's new Emirates Stadium will 'stop the club dying at the top level' by giving him more money to spend on players. The 60,000-seat arena will be open for the start of the 2006/7 season and it is hoped it will produce up to 50% more revenue than is currently generated by Highbury. Wenger was part of the 'topping out' ceremony inside the new venue on Monday and admitted he does not believe the club would have made more progress if they were forced to stay in their current 38,000 capacity home. 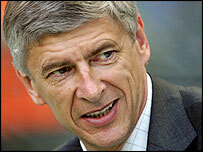 "The Emirates Stadium is vital to our future," Wenger said. "At one stage this project was only 50-50 because it was very complicated and expensive but the board of directors felt we had to go for it or risk dying at the top level. "I'm happy at the club and will stay as long as I can respond to the supporters' expectations and have no plans to leave. The new stadium increases my motivation to take this club to the next level with the potential increase in revenue making a huge difference in the market." Wenger endured a difficult summer in the transfer market with Alexander Hleb his only major signing, while captain Patrick Vieira and Edu have both departed. He admits that while Highbury is a footballing theatre, the financial limitations it places on him can be a problem. "It is sometimes frustrating but it's also challenging to find solutions to fight bigger clubs with more money," Wenger said. "It's also exciting to try to be a bit more creative and risky in other areas which you wouldn't need to be if you had more resources."